San Diego has many beautiful areas in which one can play with a camera. Some of the places are hidden, like under the trees in Tecolote Canyon. Some of them are out in the open, for all to see, like Fiesta Island. Fiesta Island is in the middle of Mission Bay. People play Over-The-Line there. They go water-skiing, kayaking, watch the Thunder Boats, walk their dogs. People do all kinds of things there. Mostly people do those things on the edges of Fiesta Island, next to the water. After all, is that not why you go to an island in Mission Bay, to play on a beach, and in the water? But on the interior of the island, things are quite different. Here is a link to a bunch of images on Fiesta Island. Most of these images have nothing to do with the water. And then, we have the image of the Jimson Weed. It was hidden under the yellow flowers, on the little-traveled interior of Fiesta Island. 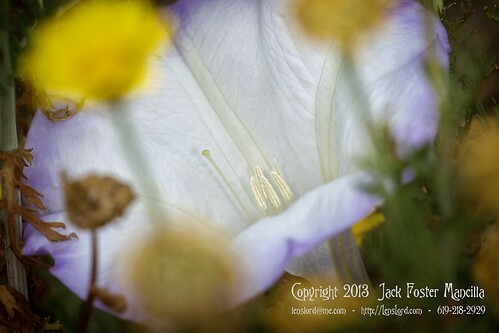 This entry was posted in Flora, Flowers, Macro, Nature, Purchasable - As Art Prints. Bookmark the permalink. ← Pocketwizards – Lions and tigers and bears. Oh, my!